Mate SuperMax™ is a proprietary next generation coating specifically formulated for punch press tooling. A hard, wear resistant, and lubricious coating, SuperMax acts as a barrier between the punch and sheet metal to greatly improve stripping. In customer testing, SuperMax outperforms currently available premium coatings by 2 to 8 times, depending on the application. Applied using the very latest nano-layer technology, SuperMax’s harder, denser film greatly increases wear resistance and has a much lower friction coefficient of about 20%. Lower friction means less heat build-up, less galling and longer tool life. SuperMax is particularly good for adhesive wear tooling applications. The lubricity is also beneficial when punching sharp cornered shapes with a 90 degree or smaller angle. SuperMax is recommended for applications such as 3000 and 5000 series aluminum, cold rolled, galvanized and stainless steels; even pre-painted, vinyl coated and fiberglass materials. 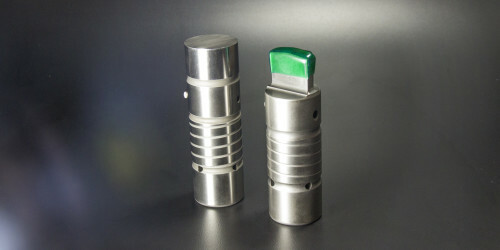 * Mate’s SuperMax tooling can be identified by its subtle matte finish and a protective green cap when shipped.